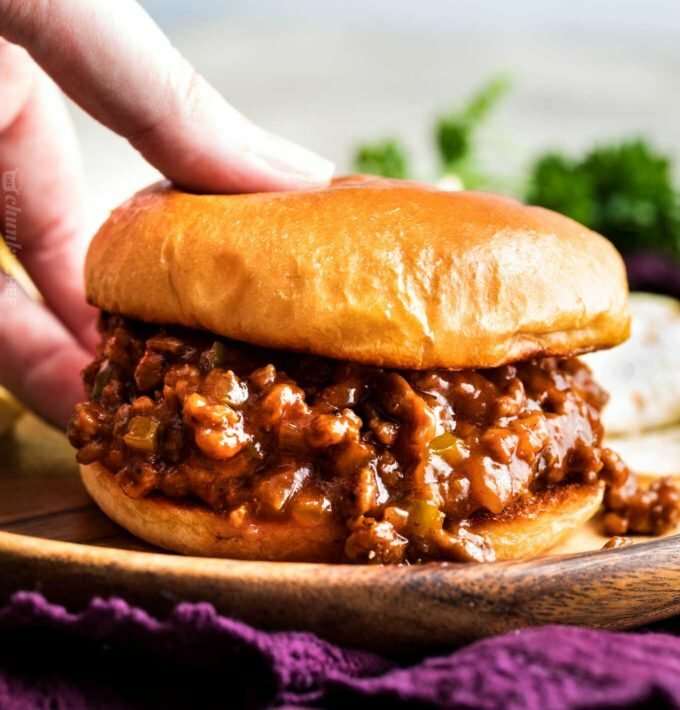 Step away from the canned sauce and give these homemade sloppy joes a try! They’re truly the best version of a childhood favorite! I’ve always been a fan of classic sloppy joes. There’s something so innately satisfying about the sweet and savory combination and messiness of it all! And I know you all love them too, since I’ve been getting a lot of requests for sloppy joe recipes. I’ve made a LOT of sloppy joe recipes lately, trying to come up with the perfect one. Some were too sweet, others too spicy. Well guys, I finally got it. The perfect balance. 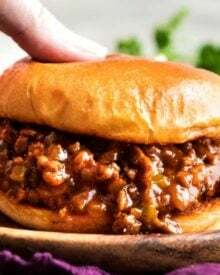 This sloppy joe recipe is sweet, tangy, zesty and savory, with the perfect texture and consistency. 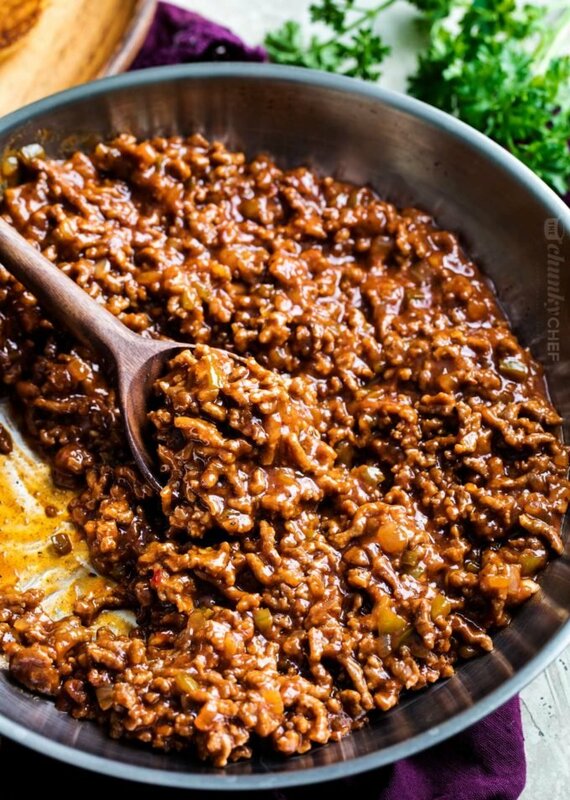 Homemade sloppy joes are incredibly easy to make, and come together in one skillet in about 20 minutes or so. Browned beef is mixed with onion and green pepper and simmered in a sweetened tomato/ketchup sauce. The secret is in finding the right seasoning for the sauce! WHAT’S THE DIFFERENCE BETWEEN MANWICH AND SLOPPY JOES? Technically Manwich is a pre-made sauce that’s used to make sloppy joes. I’m not sure exactly what’s in it, and have never tried it myself, so I can’t say that my recipe tastes similar or not. 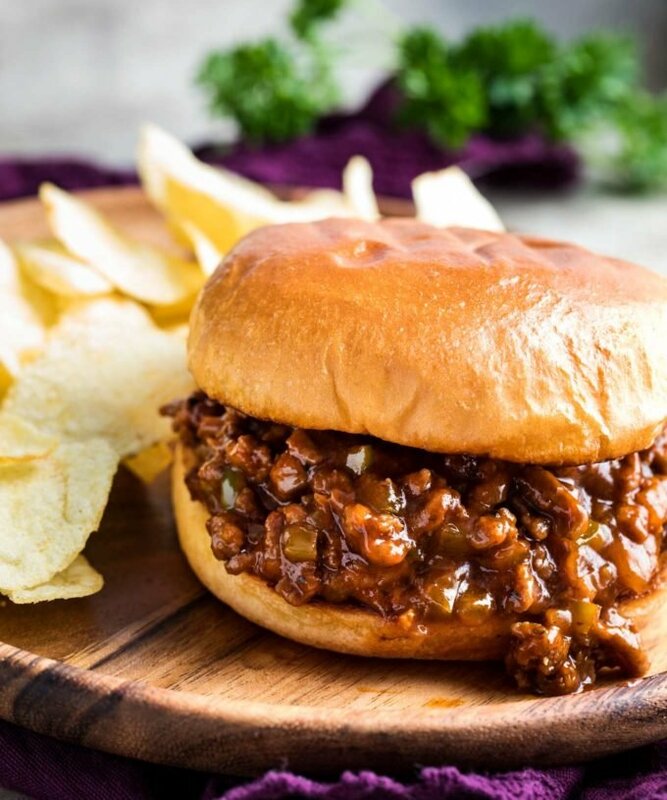 Manwich is marketed as a easy way to make sloppy joes… but in reality, homemade sloppy joes are JUST as easy to make! From what I can glean from the good ol’ internet, a cook named Joe in a cafe in Sioux City, Iowa added a tomato sauce to a loose meat sandwich. It must have been a favorite and took off! Roll up in crescent roll dough and bake at 375 F degrees for about 12-15 minutes. Cheese makes a great addition to these as well! You can! Just brown the beef and add all the remaining ingredients (no buns though), and cook on LOW for about 4-6 hours, or HIGH for 2-3 hours. This will have a softer texture than skillet sloppy joes though. 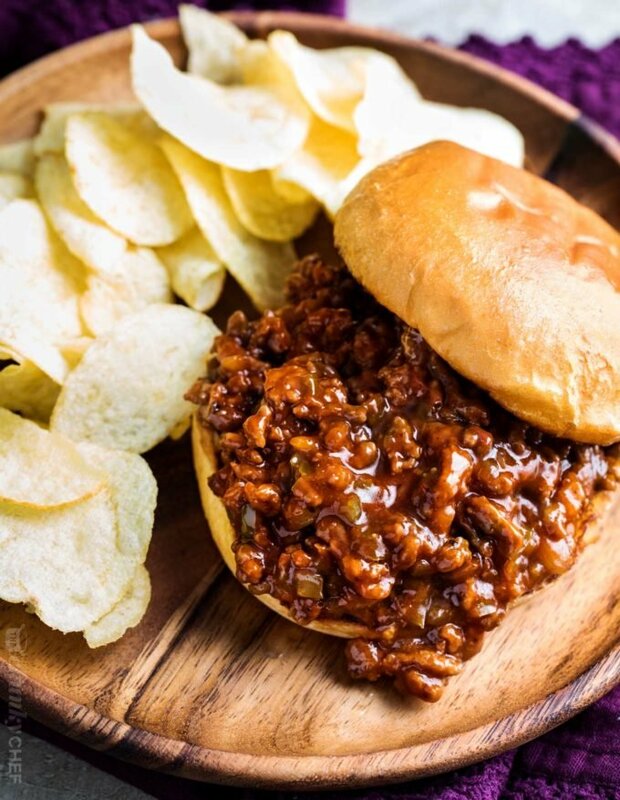 Step away from the canned sauce and give these homemade sloppy joes a try! They're truly the best version of a childhood favorite! Heat butter and oil in large skillet over MED/MED-HIGH heat. Add beef and brown, breaking apart into crumbles as it cooks, about 5 minutes. Drain. Add onion and bell pepper to same skillet and cook 2-3 minutes, until soft. Add garlic and cook 30 seconds or so, until fragrant. Add beef back to the skillet and add tomato paste. Stir well. Add ketchup, water, brown sugar, mustard, chili powder, Worcestershire sauce, salt, red pepper flakes (if using), and black pepper. Stir well to combine. Cook over MED heat for 10-15 minutes, until mixture has thickened to your liking. Remove from heat and serve over toasted buns. As a longtime Manwich lover, I will be making these again next time I have a craving for Sloppy Joes. So. Much. Better. DELICIOUS! Thank you for sharing. Didn’t have manwich sauce in the cabinet. Don’t need it ever again now! Everybody gobbled it up with not a single spoonful left. I’m surprised it was so easy and yet so good. Definitely a keeper! For me it was a good base for Sloppy Joes. I quadrupled the recipe since we have bottomless pits aka kids. So I added a whole 28 oz. box (yes box) of tomato sauce and cranked the heat so that I could evaporate the water. I played with the same ingredients called for and came out with a pan of sj’s we liked. That’s why the 4 star rating from me. I like the ideas on what else to do with the meat too. We’ll see if there’s anything left to try them. I just made this! ( I USED 8 POUNDS of beef. I used all the ingredients ×8 )Wow! Great recipe. I did however add two more table spoons of brown sugar Now I’m taking this awesome sloppy joes to feed 26 kids-after their school play practice. This was a pretty legit grown-up take on the SJ! My wife declared it a keeper, my two year old devoured his small portion and even I, a sloppy joe non-believer, was won over. To be fair, a few modifications were made: 50/50 blend fresh ground chuck and ground pork, a skosh less sugar and a skosh more Worcestershire, and a dash of oregano. Everything else as written and will remain so. Served alongside, and, eventually mixed with, some tots and slaw. I love this sloppy joe recipe! I first found it about over a month ago and I’ve made it at least 5 times. 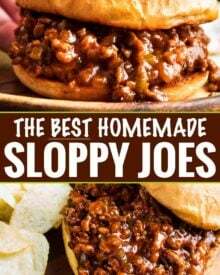 It’s the best sloppy joe I’ve ever tried and my partner loves them too. He says it tastes just like Manwich.. (only better!!). Thank you for sharing! Great. Easy to make. Will make fir the next group get together. Great recipe! Best sloppy Joe I’ve ever had. Love the idea of buttering and grilling the rolls! It was a little too sweet, but I kinda eyed the sugar. I didn’t use hot sauce, because I’m a big baby when it comes to hot food. The pepper flakes gave it enough spice for me. Will definitely make again! Thank you! I made this for dinner last night. It was very good. I personally don’t like ketchup in my recipes but when in Rome… for me it could have used a little more spice, such as minced hot peppers, hot sauce, chili or cayenne pepper powder, but my wife and daughter don’t like anything spicier than black pepper. It must have been good because they each wen back for seconds. I served this on homemade sesame pretzel buns which were absolutely wonderful and made the meal. Will be making this again, albeit probably with some tweaks. Can I just say…FABULOUS! The only thing I omitted was the red pepper flakes and my family almost licked the pan! Excellent! Way better than the canned stuff! 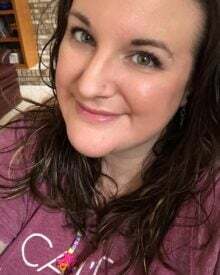 I used ground turkey… my husband raved!!!! Best ever sloppy Joe’s! So balanced. 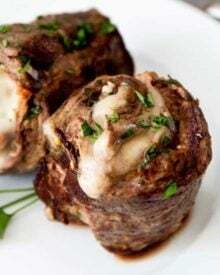 If you have a trued and tested meatloaf recipe, I would love to have it! Perhaps you missed the purple “jump to recipe” button at the top of the post, so you can literally go right to your FREE recipe. 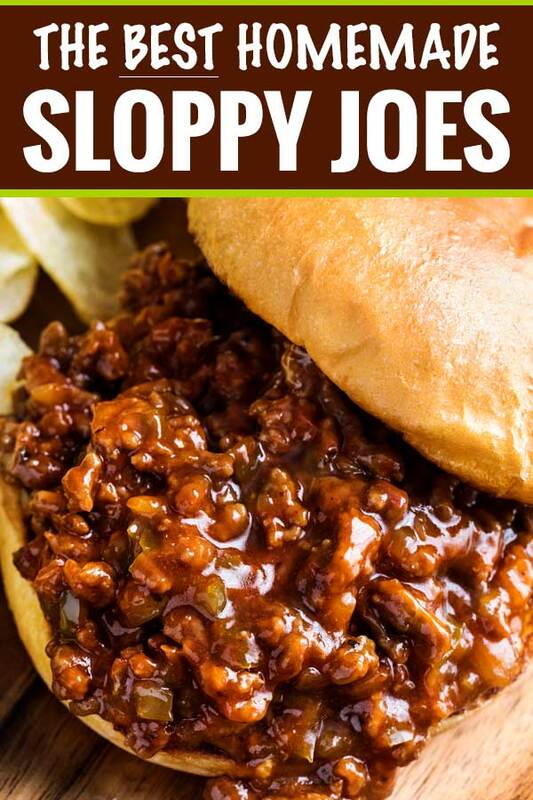 Seriously the best sloppy joe recipe. I’m taking care of my daughter just out of the hospital and she asked for sloppy joes. I found this recipe and tried it and it turned out perfect! Her fiancé was like Sloppy Joes? Who asks for sloppy joes? Like I remember having to eat those in high school at lunch but… well he ate two piled high and declared he got the leftovers too!! Thanks! I wonder how this would be with chicken instead of burger. I think that would be tasty! I tripled this recipe for 4 hungry teenagers and 2 adults, there was barely any left for lunch the next day! People were coming up and just scooping it onto the plate and eating it without buns. I mixed the ingredients from the ketchup to the salt in a separate bowl and blended it together before pouring it into the skillet and it was just so good. Thank you!! I heard of a sloppy joe recipe using taco seasoning. Do you have that recipe? I do not have that one at this time, but am always open to new ideas for developing recipes! Tasty recipe. I made a double batch of the sauce by itself because I used died leftover brisket instead of hamburger. The only things I did differently were leaving out the tomato paste because I didn’t have any and used stone ground mustard. There may have been a few extra shakes of westchester sauce because I like the stuff. In a pinch I found this recipe. I did not have enough onions or cstup so I substuted the catcup for tomato sauce and onions I used a tablespoon of dehydrated onions and used 1 teaspoon of garlic powder instead of fresh. This actually turned out pretty good. Great alternative to the canned version, way better actually! I will definitely make it again, maybe with a smidge less sugar. For five servings using drained 80/20 ground beef, I calculated 233/calories per serving not counting bread. Not bad for “comfort food”!. Thanks for the recipe! Great recipe! I doubled it and served them on homemade hamburger buns. Family of 5 all enjoyed, my 8 yr old put cheese on hers, the rest of us prefer more kick. The only modifications I made were that I took another reviewers suggestion and added a splash of apple cider vinegar, and I subbed carrots for the green peppers (my husband can’t eat nightshades). Was delicious on a fresh grilled brioche bun. Added 4 wickles pickles to each bun. Perfect!!! These were just what I was looking for! These had a great depth of flavor that is impossible with a can. This will be a keeper! Thank you! Have to tell the truth…I didn’t measure the ingredients but made it to taste. I did use your ingredients for the base. Added a bit of apple cider vinegar for extra tang and a sprinkle of paprika for a bit of extra kick. They were pretty dang good if I say so myself!! As I’m not a nutritionist, I don’t provide full nutritional information for my recipes. Your best bet would be to copy the ingredients into your favorite online nutritional calculator. It was good. Not exactly like the one from my childhood but still really good. Added another tbsp sugar, 4 tbsps of Worcestershire sauce and 1/3 of BBQ sauce. The BBQ also darkens it a lot more. I substituted hamburger buns with hotdogs buns. It’s less messier that way. Some very discerning sloppy joe lovers declared this the best they’d ever had. Excited to make these for an upcoming ski trip! Can I make ahead and freeze or would you not recommend? These sloppy joes freeze great! I make internet recipes alllll the time and have never left a review. This my friends warrants a review. AMAZING! Just make it. At least double it because it’ll go fast! Delicious! It will be a new favorite. Simply D-lish! Made it “as is”, Absolutely wonderful, you get full control of your ingredients (i.e. no high fructose corn syrup like Manwich). For the hot sauce I used my favorite local favorite. Went light on the onions to suit family. Even better the next night (or I was anticipating it more, not sure which). Thanks for this great recipe! I’ve never made it without the ketchup, so I can’t guarantee the flavor, but I would guess some tomato sauce. 1 tbsp Vinegar and tomato sauce should be fine. 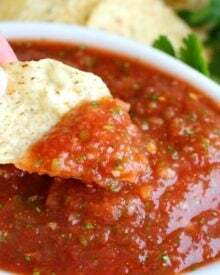 Used some of my husband’s homemade red sauce (we use organic products) instead of paste and ketchup and water. doubled everything. I used red pepper instead of green. I also used powdered mustard rather than prepared. 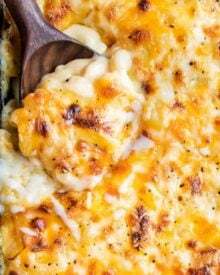 Yep this recipe is delish, I’ll make it anytime!!!
. Will serve on a pretzel roll. Looking forward to it. Kinda wondering why you’d need butter & olive oil to brown fatty hamburger when you drain it off. Butter and olive oil cost too much to be pouring it out. I understand using it for flavor maybe after the meat has been browned and drained. 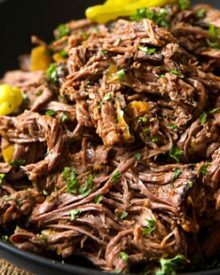 Depending on the fat level in your beef you may not need to drain it, but feel free to switch the recipe up if you want. I write the recipes how I cook, and the butter and oil add flavor to the skillet. And enable cooking. Try it! The only change I made was to add beef broth in place for water for a richer flavor yummo!!! Fabulous! Served ours in fry bread and I think we have a new favorite meal. My husband said “best sloppy Joe’s ever”. Not too sweet and not too tangy. Perfect consistency, not too watery …it didn’t ruin the bun with juice. I added 1 additional Tbsp of tomato paste and used the whole onion since my family likes onion. We browned the onion, garlic, and beef together and it was great. Thanks for this! It’s going in my fav recipes! Very nice. Needed a recipe for some veggie crumbled we had in the house and this worked great! Quick, easy, and tasty. I liked it quite a bit. I found it a bit sweeter than I prefer and the chili flavor wasn’t as strong as I like (and I’d already increased from 3/4 teaspoon to a full teaspoon. I will make again but debating on either omitting the brown sugar or finding a less sweet substitute for the catsup (The hint of brown sugar adds a great flavor note) . I’ll also increase the amount of chili powder to at least 1 1/2 teaspoons. 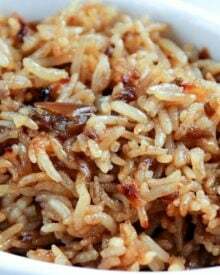 I tried this recipe today only using red pepper instead of green . Also doubled the recipe and it came delicious. Thank you, everyone loved it . Definitely be making it again soon! I just made this. Like now. Everyone LOVED it! Not gonna lie, these look really special. I just got super hungry! Better than Manwich! I didn’t have Worcester so subbed soy sauce. Delicious! Such a great weeknight dinner! So delicious! Yum! 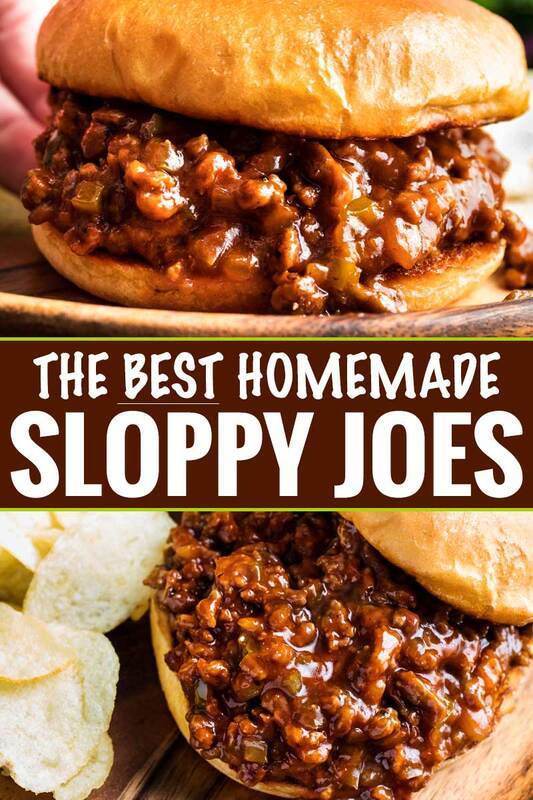 I grew up on sloppy joes…can’t wait to try your recipe! Looks incredible! 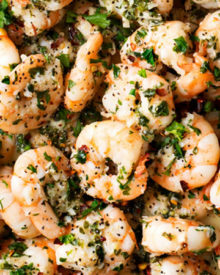 Love how easy to make this tasty and flavorful recipe, it’s just perfect! Homemade versions are always so much better! So much more flavor! Homemade sloppy joes are the best! I can’t wait to try your version! I love the other ideas for using sloppy joe meat – I bet it makes for epic loaded fries!